F: The IIS 2008 management pack actually needs Microsoft.Windows.Server.2008.Discovery (which needs Microsoft.Windows.Server.Library.mp) which is part of Windows Server Operating System Management Pack for Operations Manager 2007. Reference: Installing all the Prerequisite MPs for the Cloud Services Management Pack. B: In System Center 2012 Service Manager, there are two types of connectors for System Center Operations Manager. You use the first type of connector, the alert connector, to automatically generate incidents that are based on Operations Manager alerts. You use the second type of connector, the configuration item (CI) connector, to import discovered objects from Operations Manager as configuration items into the Service Manager database. Reference: Importing Data and Alerts from System Center Operations Manager. Reference: How to Create a System Center Operations Manager Connector. A: Gateway, System Center Management service, 5723/TCP. B: if there is a firewall between the agents and management servers, multiple authorized endpoints must be defined and maintained in the firewall rules to allow communication between them. To reduce this administrative overhead, Operations Manager has a server role called the gateway server. Gateway servers are located within the trust boundary of the agents and can participate in the mandatory mutual authentication. Because they lie within the same trust boundary as the agents, the Kerberos V5 protocol for Active Directory is used between the agents and the gateway server. Each agent then communicates only with the gateway servers that it is aware of. The gateway servers communicate with the management servers. Reference: Operations Manager 2012 Firewall Scenarios. Reference: Distributed Deployment of Operations Manager. Server4 VMware ESX Server 2.5. Server5 VMware ESX Server 3.5. Server2 Data warehouse management server. Server3 Microsoft SQL Server Reporting Services. 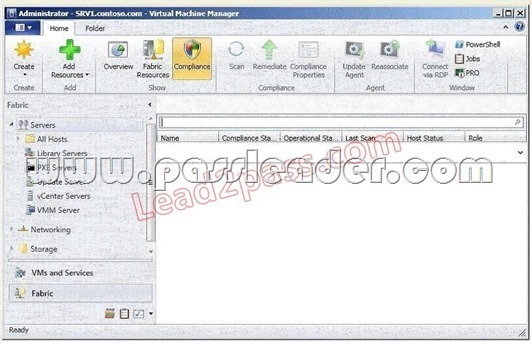 Host11 Windows Server 2008 Service Pack 2 (SP2). The ServiceManager database is sometimes referred to as the CMDB. It is the central store of all configuration items and work items managed by Service Manager. It also stores all the customizations and configuration for the Service Manager product itself. DWStagingAndConfig stores the configuration for the data warehouse and is used as a temporary place to stage the data as it moves from the ServiceManager database into the other parts of the data warehouse (DWRepository and DWDataMart). E: SQL Server minimum requirement: SQL Server 2008 R2 or SQL Server 2008. Not D: Windows server minimum requirement: Windows Server 2008 R2. Reference: Prerequisites for Upgrading to VMM. Put the template on the Library server (host 1). Add the second host (host3) to the Host group on the library server (host1). Reference: Rapid Provisioning of Virtual Machines Using SAN Copy Overview. E: Gateway, System Center Management service, 5723/TCP. D: if there is a firewall between the agents and management servers, multiple authorized endpoints must be defined and maintained in the firewall rules to allow communication between them. To reduce this administrative overhead, Operations Manager has a server role called the gateway server. Gateway servers are located within the trust boundary of the agents and can participate in the mandatory mutual authentication. Because they lie within the same trust boundary as the agents, the Kerberos V5 protocol for Active Directory is used between the agents and the gateway server. Each agent then communicates only with the gateway servers that it is aware of. The gateway servers communicate with the management servers.